Celebrating the life of William Jackson Toler, Sr.
Obituary for William Jackson Toler, Sr.
Bill was born in Johnston County on November 24, 1927, to the late William Falton Toler and Lillian Mumford Toler. He proudly served his country in the United States Navy during World War II. Bill retired from his work with Civil Service at Seymour Johnson Air Force Base. He was a charter member of Grace Baptist Church in Goldsboro. 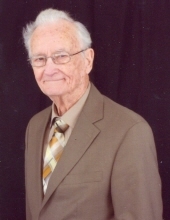 Bill was devoted to his church, served as a deacon, Sunday school teacher, trustee, and was involved in many other activities where he utilized his gifts and abilities to share the love of God. A service to celebrate Bill’s life will be held at 1:00 p.m. on Thursday, April 4, 2019, at Grace Baptist Church with Rev. Jason Stoeber officiating. Interment will follow in Wayne Memorial Park with military honors. The family will greet friends on Wednesday, April 3, 2019, from 6:00 – 8:00 p.m. at Seymour Funeral Home. Bill is survived by his wife of almost 72 years, Ruth R. Toler; daughter, Lynda Toler Allen and husband Terry; son, William Jackson Toler Jr. and wife Toni; grandchildren, Charity Ruth Allen, Ben Toler and wife Lana, Markel Toler, Trey Toler and Greg Toler and wife Nicole; great-grandchildren, Aiden Pinkston, Heath Allen, Asher Hankins, Rowan Toler and Vivian Toler; and sister, Ann Toler Smith. He is also survived by his extended family, Gretchen and Ryan Kroschel, Kelly and Andrew Hankins, and Jennifer Mocha and her children, Lily, Sophia and Nikoli. In addition to his parents, he was preceded in death by his grandson, Glyn Allen; sister, Marie Rogers and brother, Jerry Toler. Flowers are welcome or memorials may be given in his memory to Grace Baptist Church, 1715 Royall Avenue, Goldsboro, NC 27534. To send flowers or a remembrance gift to the family of William Jackson Toler, Sr., please visit our Tribute Store. "Email Address" would like to share the life celebration of William Jackson Toler, Sr.. Click on the "link" to go to share a favorite memory or leave a condolence message for the family.